Healthy, happy and at home. Wearing cashmere hand knit socks. And thankful for every moment. Categories: EZ's baby leggings, knitting, socks | Permalink. I think this will be my last pair of socks for this year, but you never know, I’ve fallen into the habit of grabbing my sock bag with needles secured in a knitzi when I have a moment to knit. This pair of socks has a shaped common heel. 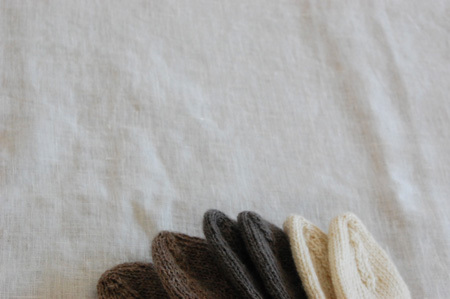 After knitting the heel flap you break the yarn, divide the stitches and use Kitchener stitch to graft them together. It felt strange breaking the yarn at the heel and rejoining it to pick up stitches along the side of the heel flap. I find comfort and security knitting with one long, continuous strand of wool. (I dream of a never ending ball of yarn in my bag. I pull the strand for more wool to fill my needles – it’s a skein with unlimited yardage and the rhythm and flow of my knitting continues uninterrupted.) The finished heel looks different than most knitted heels and I was eager to finish a sock and see how it would feel on my foot. I was pleasantly surprised that it’s a perfect fit! The straight pattern of stitches running down the leg and onto the foot makes for a quick, neat sock. A fresh, wooly hand knit pair ready to take on the coldest of winter winds this season. Socks have been the focus of my knitting lately. Small but interesting projects I can manage during the hustle and bustle of the holidays. Part of me wants to cast on for a sweater (the season calls for piles of wool to be wound and knit!) but I just can’t take on a big project at the moment. So I’ve been knitting socks. Unrolling small bundles of knits and needles. Savoring the moment when I can get in a stitch to turn a heel or shape a toe. Rich, deep colored yarn, knit in a pleasing pattern of knits and purls that remind me of bars of chocolate. I modified the pattern, casting on 64 stitches and decreasing to 56 stitches, to accommodate a larger needle size (2.75 mm) and my foot measurements. I like the twist of this yarn – not too tight or beady – and the bamboo content is a nice alternative to nylon. I’m curious to see how they feel and wear over time, but at the moment they are quite comfortable. I didn’t start my socktoberfest socks until the last few days of October. But despite my late start, I’m excited to be back knitting socks again. Inspired by Mustaa Villaa’s socks, I cast on for a pair of Heelless Sleeping Socks by Nancy Bush. There’s a lot of purling in this stitch pattern, but they still move quickly on the needles. I knit them as written from stash yarn using my favorite rosewood dpns – all factors that make for good knitting and warm feet.